Exciting news for fans who are looking forward for the recently revealed Generations Select Star Convoy figure. 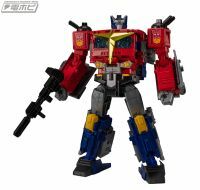 This great remold of the POTP Leader class Optimus Prime was announced to be a Takara Tomy Mall exclusive, but now it’s your chance to pre-order it directly from our sponsors. All times are GMT -4. The time now is 1:54 PM.